“We like to call this voluntary hanging”. Not really what you want to hear the night before you sit down to do a six hour, 250 question exam. That said, it’s probably an accurate description. 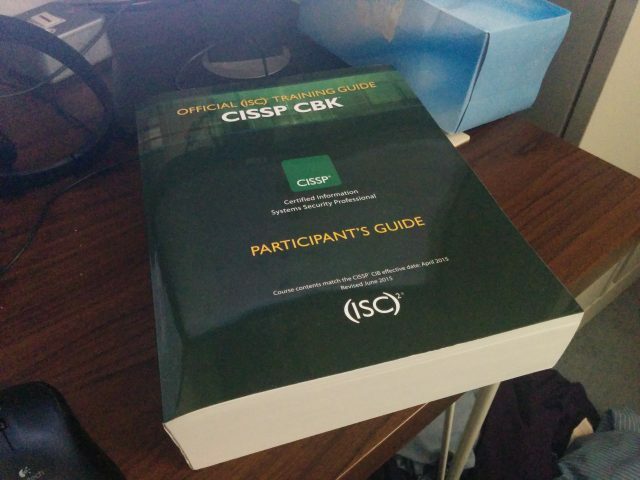 Yes, the reason I haven’t been around lately is that between working 50-60 hours a week in my day job, I have also been studying for my CISSP. This culminated the other week in a pass, which means that I supposedly know something about information security! For the uninitiated, the CISSP (Certified Information Systems Security Professional) qualification is considered to be the baseline for a security professional. Looking at job adverts, virtually all of them either require it, or recommend having it. a control put in place that is cheaper than the primary control. a control put in place to overcome the shortcomings in another control. a control put in place that automatically continues to protect the system when the primary control fails. a control that compensates for law enforcement’s or management’s lack of technical skills. The best answer here being number 2. Anyway, now that’s over, I’m going to put some time aside for writing on this site again. Highlights are going to be some stuff on network design; my fun with Corsair memory; more observations about SSL; and I’m pretty excited about the new Ryzen processors from AMD. Hopefully I might get to build a SOHO server based around a Ryzen chip in the near future. Come the summer, I’ll be celebrating the 10th anniversary of the website, because time flies when you’re having fun. I’ll look to do another edition of the Cheapest PC series, which I have also been neglecting. That said, the long term trend for the price of computers falling in cost may be over with the messed up exchange rate meaning US dollars and British Pounds really do line up! Oh, and one last thing… I have a great paperweight for my desk!